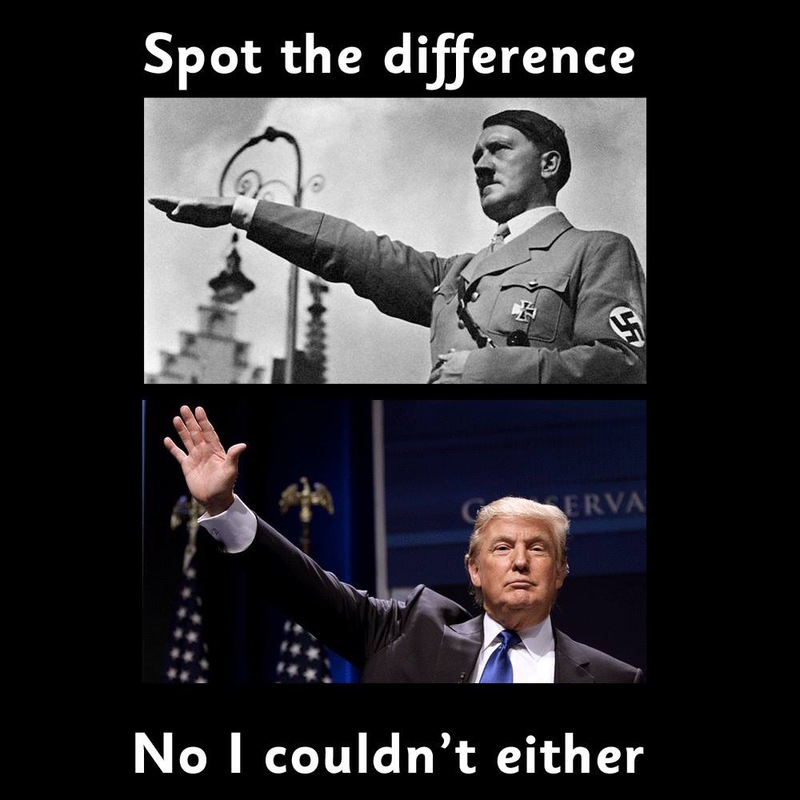 I have challenged my good friends on the Left who continue unabashed with their Trump-Hitler equivalence theme and yet refust to articulate exactly how Trump’s policies resemble Hitler’s and/or the Nazis. 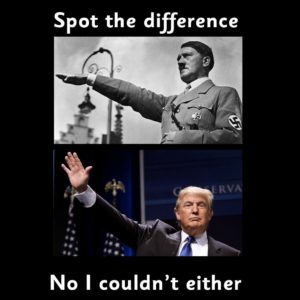 So, over the past few months I’ve been doing research and am now ready to submit the following ways Trump and his Republican policies are distinct from Hitler and the Nazies. These 9 policies represent benchmarks that marked fascist Germany as a blot on Western civilization and the enemy of liberty. I challenge my friends to counter these 9 points and/or advance others that I’ve missed. 1. National Socialism (private property tightly controlled by government) was implemented as the official economic program for Germany. 2. Deutschland über Alles was the Nazi slogan, meaning “Germany over All.”, “Germany First“, “Germany Rules” much less “Make American Great Again“. Germany over All was a slogan declaring Hitler’s goals of conquest in Europe and the world. 3. Aryan racial supremacy (opposed especially to Slavs, Jews, and gypsies) was made official policy, not merely a personal preference. 4. German foreign policy was ardently expansionist and its policies were based on the need for lebensraum(“living space”). In this, the government openly articulated its desire to expand geographically in Europe at the expense of neighboring entities. 5. Hitler’s anti-French revenge motif was articulated in his German bestseller Mein Kampf. Hitler, a veteran of WWI, was shocked to his core by the humiliation of losing in WWI, the forced signing of the War Guilt Clause of the Treaty of Versailles, and French control over the Alsace-Lorraine after WWI. 6. The Nazi party platform was based and advocated for women to adopt traditional roles in life. Specifically, the pushed the traditional role that a woman’s place is in the home (Children, Kitchen, Church – Kinder, Küche, Kirche). 7. Under National Socialist governance, euthanasia was authorized to eliminate children with mental and developmental disabilities like Down syndrome. 9. Importantly, love of man for God and of each person for his neighbor no longer was eliminated as the living ethic and metaphysic of Germany. Rather, Hitler and the Nazis largely identified with Frederick Nietzsche’s will to power theme, whereby humans are meant to evolve to a new stage of moral development. At this stage, God is dead, and the new, supposedly evolved (Aryan) personality type will implement the transvaluation of values, where bad is good and good is bad. This evolved person will be a type of übermensch (superman), a person of power, even without a big red letter S on his shirt. Adolf Hitler was to be understood as the personification and embodiment of the übermensch. The people who cast this calumny so easily on those with whom they disagree and without any semblence of reflection give evidence to their ignorance and their cruelty. None of the 9 ideas above even remotely resembles the policies or programs being advanced by President Trump. Socialism? Trump has been busy de-regulating commerce, not tightening regulations. His program of America First is not a program of conquest, but a re-prioritization of America’s economic and political goals. Racism? Trump’s political and economic policy is not to disparage or invalidate any racial or ethnic group. His soaring poll numbers among Hispanics and African Americans testify to something his detractors refuse to acknowledge. His desire to be cautious about immigration from Islamic countries is rational, not racist nor ethnocentric. American’s immigration policies under Trump express a concern about domestic U.S. safety, and not animosity to Muslims. He, unlike most of his critics, is aware that in Islam, hijra (immigration) is a stage in promoting Islamic sharia law as the dominant political, legal, and religious framework of the world. This is clearly articulated in Islamic holy books and promoted by Islamic leaders. The virulent thread of domestic terrorism is rife throughout the Islamic world, and both Europeans and Americans have already suffered excessively from this threat. President Trump has publicly reprimanded various allies and various U.N. bodies such as the Human Rights Council. These reprimands have been under a pro-American rubric without any threat of conquest or harm to those countries. Yes, the president has been truculent in his response to threats from others like Iran or North Korea. But so what. How is that like Hitler. Trump’s critics have become comfortable with low-key dissembling of President Barack Obama, characteristic of the Leftist elite and their followers. Moreover, unlike Hitler these reprimands have been defensive in nature, not offensive. Not one aggressive intention toward another sovereign entity in this world has issued forth from his mouth or from the actions or policies of this administration. Women? Nazi contempt for women is linked to the Nazi-Nietzschean “will to power,” where the macho male alone is qualified for governmental or corporate leadership. There is nothing in Trump’s corporate background in construction or his appointments made in the Oval Office that indicates that women have been excluded from leadership and policy-making roles, as was the case with the Nazis. Finally, President Trump has openly embraced our country’s Christian heritage. His comments in public about Christianity and people of faith are uniformly complimentary. While we do not have a state established religion, our Christian values and heritage are central to the formation of our growth, power, and generosity. Trump’s concern that religious rights under the First Amendment be faithfully balanced against and factored into judicial decisions upholding the due process rights of the 14th Amendment is clearly demonstrated by his judicial appointments. For the above reasons, and because President Trump can be challenged in elections and is limited by our federalism as well as checks and balances, it is totally offensive and absurd, not to mention stupid and/or willfully ignorant to liken our Trump and his administration to the Nazi cult; its vile leader; or its program of conquest, death, and hate. This entry was posted in Hitler comparison, Judeo-Christian Values, Leftism, Political Ignorance. Bookmark the permalink.